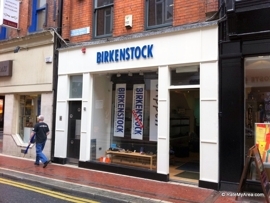 I hit my forehead against the side of a glass shelf in the Birkenstock shop at 36 Wicklow Street this afternoon. The blow inflicted a sharp pain which faded until this evening, when I absent-mindedly rubbed my forehead as I was watching Upstairs Downstairs on BBC4. The man behind the till in the Birkenstock shop was old, with the air of an indifferent butler and if he noticed my accident, he masked his perception with perfection. Then I met my friend Reuben at Central Bank. He had on shorts and as I approached him he was reading. There’s that way that we all stuff a book out of sight or yank earphones into a tangle when somebody we have been waiting for approaches us suddenly. A universal movement away from ourselves and into that self-governing realm of conversation. Reuben’s cup had flowers on it and contained lemon and green tea, but mine was glassy and plain. 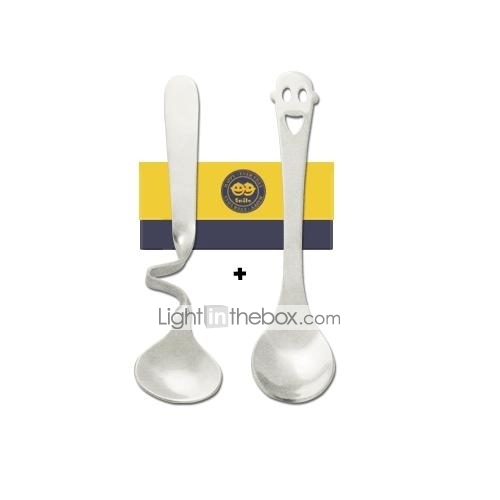 We both got bendy spoons though, which hovered over the rims of our cups and I didn’t notice until Reuben pointed it out, that the spoons were smiling. When it was time to pay, I put a tiny sum into the tip jar and took a mint. I felt bad when the waitress offered me a mint after, because that meant I had taken mine out of turn. On the way home I crossed the road because there were boys in tracksuits on my side. In Centra, the Irish Times was sold out but there was a handful of London Times and Independents left over. My mum read me two German Christmas stories tonight. She is the best reader in the world. During Upstairs Downstairs my dad cupped his hands expectantly so I threw him a Malteser. After that I threw Maltesers at him without his hands being cupped. In Avoca, a table yelled for my mum and two girls gave her effusive hugs. Grateful, smiling students of hers. It moved me strangely. I was feeling tender today, with preoccupations of an uncertain future. We met the mother again, as we were walking into Zara. She said it was ‘crazy’ in there. There is a golden button missing from my coat. It came that way, but I have a spare because my boyfriend is magic and he went into AWear and asked for one once. They ripped a button off a faulty coat for him and I have been meaning to sew it on for seven weeks. I wondered today where that button was, but then, outside the Pound Shop in Rathmines, I felt it in the undersized pocket of my coat. My sister and I sat beside the fire and when our feet touched by accident, her toes recoiled and danced away in disgust. She left the room to talk to her boyfriend while I listened to my mum’s stories. When she came back, we talked about epigenetics and how everything is related to everything. I told my mum about what Ian McEwan said. That to write, is to have a detail, and not a story. That Atonement sprang from a single observation of his bossy elder daughter directing and staging a play. That a single detail can grow into love and war and betrayal and atonement and a moving masterpiece. I’ve a lot more to gather, but this was a start. I wish there were a fly in my eye. If I were a fly, I would crawl up billboards and over the faces of celebrities advertising shampoo. If I got peckish I’d fly to my nearest bakery and alight on an almond bun. I’d avoid flying on my own on dull days in case I got trapped in a spider’s web that’s only visible in the sun. I’m not a fly though and so I’m forced to navigate the world conventionally. I have to get a job to buy an almond bun. I need to battle against the forces of economic psychology to buy cheap supermarket own-brand shampoo with no promises of instant glamour and folical success. And I can crush a spider’s deathtrap with my fist. I just finished ‘reading’ (three of the seven essays consist of a series of images with no words) John Berger’s Ways of Seeing and though there was a lot I read too superficially to grasp, the last essay, which focusses on publicity and consumerism, got me thinking about the place where I drank a whiskey and lemonade last Saturday night. It was the basement of a nightclub on the quays called ‘Gypsy Rose’. 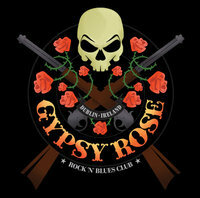 The walls, table-tops and tshirts of the band were decorated by gothic-style roses and a backdrop of despondent-looking skulls with over-sized teeth biting into shotguns. The lighting was dim, the band playing exceptionally loud and the decor scarlet and deep purple. My flowery green dress, polo neck and snow boots flouted the dress code. Nearly everyone there had multiple tattoos. My friend told me that it’s a familiar haunt of the ‘tattoo society’. I thought he meant to break it to me that I’d walked in on some political social, but actually he just meant that it’s full of people with tonnes of tattoos, which I could see for myself. If they weren’t musuclar skinheads wearing band tshirts, they were charmingly nerdish-looking and in leather trenchcoats. The girls had edgy jet black hairstyles and facial piercings and next to them I looked like a ridiculous daisy sprouting from a graveyard patch of bleeding roses. The whiskey was good and in spite of its unreasonable volume, so was the band. And yet, there I was with my eyes convincing me that I shouldn’t be there. No biggy; just not my kinda place, I mused on the luas home. I just like it more mellow, with pots of tea and shisha and perhaps an acoustic guitar in the background. “Damn hippy indie chick” somebody probably sighed as I took out my book. I think I find comfort and shame in equal measure in the personalised telescope through which I view the world. I’m comforted because by knowing through sight what I am not I can guess what I might be instead. I am ashamed because I never look through the lens for long enough to understand fully what it is that I am not. PS – I would love to capture, spookily, the Zeitgeist in a piece of prose. I can’t, because I am much too busy lounging in my own world view. If I were a fly,I might get trapped in a web of images, but at least I’d have had the privilege of a bird’s eye view of the world. I trod upon this Winter Wonderland two nights ago; perhaps you can see my footprints in the snow. 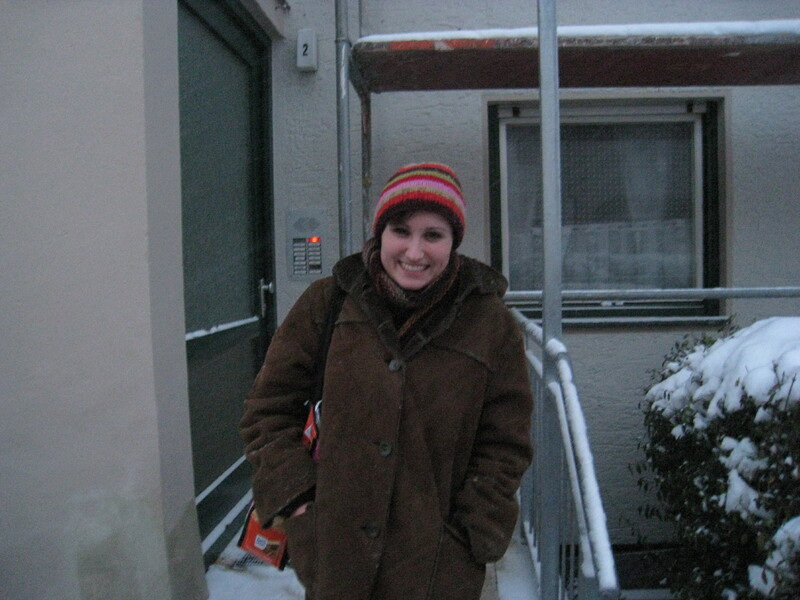 This is my mother’s hometown of Regensburg, Bavaria and I am seeing it for the first time in the winter. I know it from the summers of childhood and adolescence as the place where first I splashed my toes into cool drinking-water fountains and then wandered moodily into the branches of H & M and Müller in the hope of diversion from the obligations of ‘extended family’ holidays. The German side of my family is enormous – my mother is the fourth child of nine and at last count my cousins tallied close to thirty. My memories of the summers between about 1995 and 2007 are rooted in a certain self – consciousness about the German I spoke, which I perceived as stilted in comparison to the Bavarian twang and slang with which my relatives conversed. Aware and anxious from a young age that I had but a single afternoon to persuade each branch of the German relatives of my lively personality and engaging wit, I presented invariably an image of dullness and excessive politeness which they perceived (with accuracy) as shyness and awkward sensitivity. I had an awful lot of fun in Regensburg too though – I was particularly fond of the twisty yellow waterslide at the local pool and the vast availability of playmobil and wooden dolls’ house accessories in the toy -shops. When my Grandmother moved out of the family home and into a flat nearby, she dedicated her biggest free space to a playroom for her grandchildren. There she set up a shop (or ‘Kaufladen’) which she supplied with a wooden till and weighing scales, dried apples from the garden, miniature packets of raisins and cinnamon-topped marzipan balls; all of which could be purchased in tiny cone-shaped paper bags, which she provided for her customers. It was marvellous. Such feelings return to me as I sit on a Regensburg and Grandmother-bound train with my boyfriend, who is not a part of these memories but who has the most incredible ability to absorb and to understand information and to remain quite silent as he does so; only to amaze me with evidence of his awesome memory at appropriate points in the future. For instance, he has recited in order the names of my mother’s brothers and sisters without ever having been formally taught, recalled anecdotes about my relatives that I don’t even remember fabricating and has learned (albeit not with great accuracy) the lyrics of the family song (yes, there is one) which is performed at the approximately bi-annual family gathering. I would forgive you for accusing me of having notions of one day appearing on one of those ancestry-tracing television shows like ‘Who do you think you are?’ . 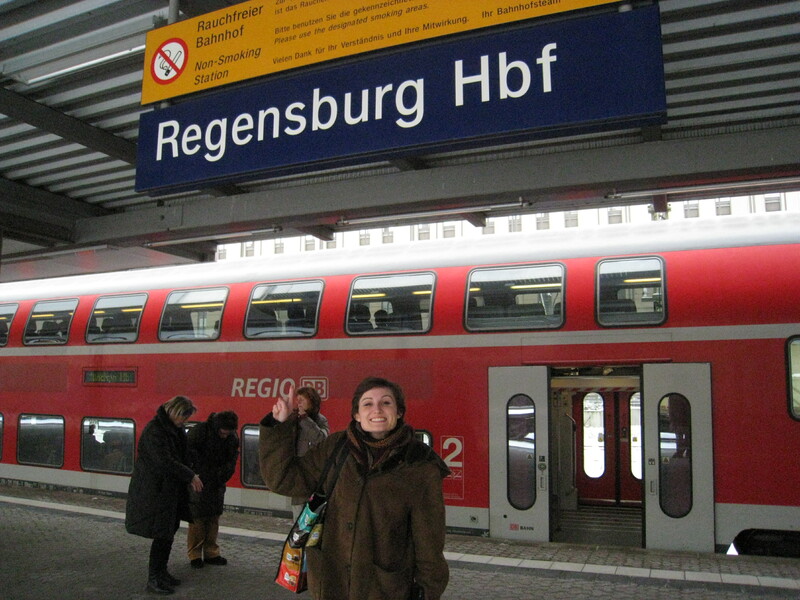 To practise for such an occasion, I ask Andrew to take a picture of me on arrival at Regensburg train station. I attempt to look restrained and dignified, humbled and delighted (as those minor celebrities do at important and scripted moments in the discovery of their past) but it is too much for me and I end up pointing with mock excitement at the sign above my head. The journey begins and we battle through a blizzard along the Danube on the way to my Grandmother’s flat. We are startled by a baby rat as it darts for cover under the inches-deep layers of snow by the riverbank. When we arrive, we are heaped with white powder. I am nervous as I ring the bell – it has been three and a half years since I last saw my Grandmother and at that time I was not romantically attached. She opens the door and pops her head out. She motions us in as if we were meals on wheels. It is wonderfully reassuring. She brews a herbal tea and we sip it as the blizzard outside continues. She tells me that she misses packing Christmas parcels for her Grandchildren; it is beyond her competencies now, she tells me, as the children are looking for gadgets and games she doesn’t understand. I tell her how I loved playing shop in the playroom and how I remember her paper bags and dried apples. She smiles and tells me she has found old letters that her children wrote to the Christkind (the German equivalent of Santa Clause). I ask her eagerly if I may see them. I may. She gets up to fetch them, and I whisper a few words to Andrew, who has remained mute at the head of the table (Andrew speaks no German and my Oma no English). I leaf through the letters of my youngest aunts: they have asked for an anorak and an extendable pencil and have promised the Christkind that they have been brave Kinder all year. After an hour and a quarter, we shake hands goodbye and venture back out. 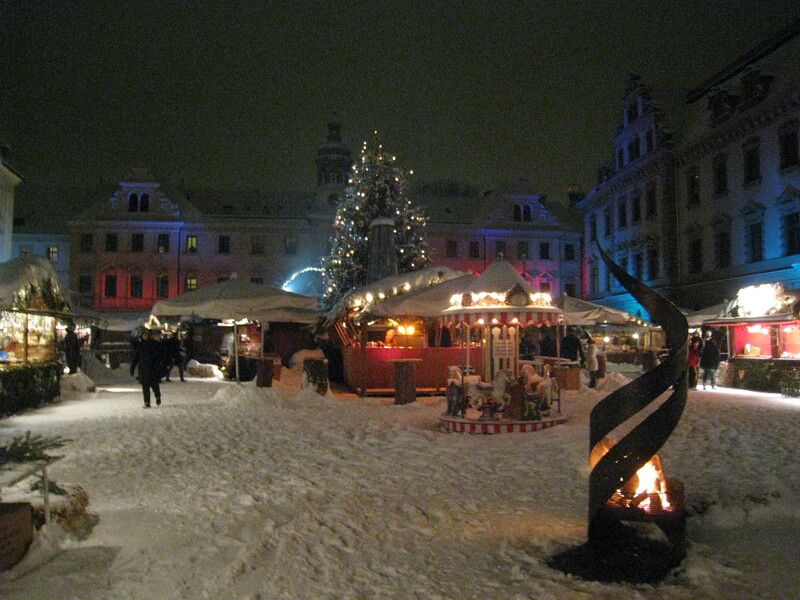 We are station-bound again but have decided to check out the Christmas market by the Castle before we leave. We are ankle deep in glistening snow. 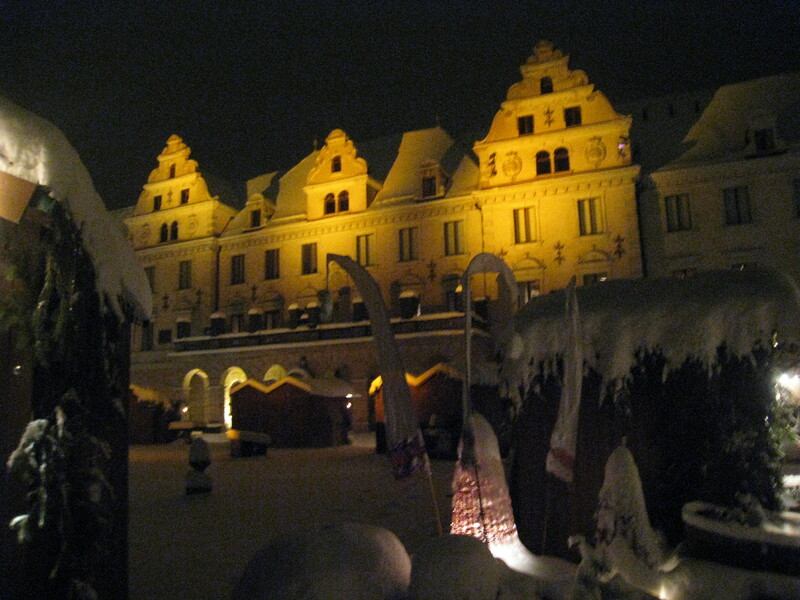 Burning torches light our way to the courtyard, where stalls of mulled wine and gingerbread lure us through the cold. Four men play Christmas carols on old-fashioned horns. Beyond the glistening snowflakes and torch flames, the castle gleams. I buy Andrew a baked potato and he buys me a woolly hat. We leave our footprints in the snow. We miss our train and spend all evening in a Winter Wonderland I feel is part my own.